Contrast Imaging Solutions is proud to be an authorised supplier of quality Barco medical-grade monitors. 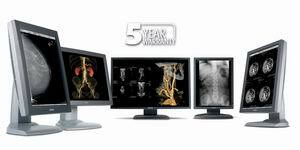 The Barco Coronis range of monitors are renowned globally as premium diagnostic quality DICOM monitors. Please Contact Us for a competitive quote on any of the Barco Nio or Barco Coronis monitors. Barco Coronis Brochure or Barco Nio Brochure. Additional information on the Barco monitors can be obtained from the Barco website. Reliability is one of the foremost requirements of medical imaging products. Barco shares your concern for quality and applies the most stringent quality standards available throughout the entire development cycle. In respect of this commitment to quality, Barco's medical displays come with industry-leading warranty. Barco's full range of colour and greyscale diagnostic and mammography displays come standard with a five-year warranty. Barco also covers the Liquid Crystal Display (LCD) panels and the backlight lamps during the economic lifetime of your display. Barco's full line of colour and greyscale diagnostic displays, display controllers and softcopy QA tools facilitate confident diagnoses while guaranteeing perfect image quality over time and across displays. Barco's 5MP flat panel display systems offer ultimate diagnostic confidence in softcopy mammography applications. Both versions bundle high-speed display controllers and user-friendly calibration and QA software.